The Department of Housing and Urban Development was established in 1965 as part of President Lyndon B. Johnson’s war on poverty. Today, the number of Americans living in high-poverty areas is on the rise. That’s a trend Barack President Obama wants to reverse. 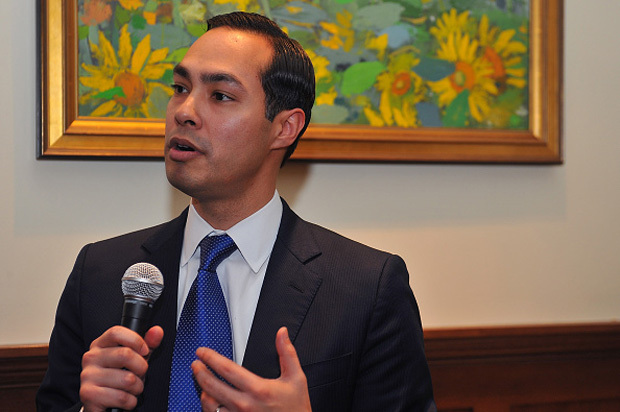 A year ago, he tapped San Antonio Mayor Julián Castro to head the housing agency. Castro is a rising star in the Democratic Party. He’s widely believed to be on the short list of possible vice presidential running mates for 2016. Castro says he’s focused on the task in front of him: Alleviating poverty through affordable housing. He joins us to talk about his plans. Julián Castro Secretary, Department of Housing and Urban Development; former mayor, San Antonio. MS. DIANE REHMThanks for joining us. I'm Diane Rehm. Three years ago, when Julian Castro was still mayor of San Antonio he became the first Latino to deliver the key note speech at a Democratic National Convention. Now, he's secretary of the Department of Housing and Urban Development. There is much speculation. He could become the Democrats 2016 vice presidential nominee. He's here with me to talk about his work at HUD an agency with a $46 billion budget and 8,000 employees. MS. DIANE REHMI know many of you will have questions, comments. Do join us, 800-433-8850. Send an email to drshow@wamu.org. Follow us on Facebook or at Twitter. And welcome to you, sir. MR. JULIAN CASTROIt's great to be here, Diane. Thank you very much for having me. REHMThank you. Glad to have you. Tell us just what HUD does. CASTROIt's a great question. You know, this year, HUD is celebrating its 50th anniversary so it's the Department of Housing and Urban Development. It was created under the Johnson administration and basically today, HUD does several things. We like to think of ourselves as the Department of Opportunity because we provide housing and we use housing as a platform to create greater opportunity in people's lives. So for instance, HUD works with housing authorities across the United States on what people think of traditional public housing, insuring that there is funding for traditional public housing, that's it's operated well and so forth. CASTROThe largest component of our budget is actually for forms of housing choice vouchers so that individuals can get a voucher and go and live in different parts of the community, go to the private sector, strike up an agreement with a landlord and have a place to call home. And we serve over 2 million families that way today. We also have purview over the federal housing administration, FHA, which is actually 80 years old, but has insured 40 million loans over its lifetime. And today is a prime driver of insuring that people of different backgrounds, folks of modest means can have access to credit so that they can become oftentimes first time homebuyers. REHMSo you've been in office about a year and I wonder what the biggest problems you've encountered are. What are the problems that potential homeowners face? CASTROOne of the biggest challenges that we see out there today is we're talking about potential homeowners as opposed to renters. I think most folks would agree, almost everybody would agree that a few years ago, as we went into the housing crisis, that it was too easy to get a home loan and in part, because of that, everybody knows what happened. Today, the challenge is actually the opposite. It's too difficult to get a home loan. We see folks with what would be considered fairly strong credit scores who have been responsible, who would pay on their mortgage if they could get a loan, but who are essentially shut out, not able to get a loan today. CASTROSo in one of my first speeches as housing secretary in September of last year, I said that given the safeguards that have been put in place since the housing crisis, and insuring that we don't slide back, with all of that in mind, it was time to end the stigma of promoting home ownership. Because if you do it responsibly, it makes sense for Americans. What we see today is that the homeownership rate is at its lowest in 48 years and that is the main driver of wealth for families. It's a way to insure stability in neighborhoods. CASTROAnd, again, nobody wants to slide back to where we were before. You want to keep safeguards in place to insure that we don't. However, you also want to insure that responsible families out there who have decent credit, who are responsible, can get a home loan. REHMAnd yet, this morning, in the New York Times, an editorial, the problem with house prices. What's going on there? CASTROWhat we see out there both in terms of the home ownership market and the rental market is on the homeownership side, we see a lack of supply, much more demand out there than supply, and that's causing, in many markets, home prices to rise. They have risen very significantly. At the same time, many of our listeners, I'm sure, can attest to this, we see a rental affordability challenge out there in cities big and small. The rents are going through the roof, so to speak, in many markets, whether it's Washington, D.C. or states in the South or on each of the coasts. CASTROSo HUD has, along with its local partners, a lot of work cut out for it and, of course, the private sector does as well and that's why we're so focused on trying to insure that there is access to credit that is responsible so people can become home owners. And on the rental side, while we continue to work and get proper funding from Congress so that we have the tools to create more affordable housing out there. REHMAnd at the same time, the number of Americans living in slums is growing at an alarming rate. Why is that? CASTROYou know, we think about the fact that HUD is 50 years old and everything that was happening in 1965 and then the Kerner Commission report in 1968 and the challenges that we had of one nation separate and unequal. And as the president said when he spoke at the foot of the Edmund Pettus Bridge to commemorate 50 years after the Selma march, there is no denying that we have made tremendous progress in this nation. We have seen the child poverty rate come down significantly. CASTROWe have seen families be able to move into higher opportunity areas, minority families become home owners, become business owners. At the same time, we were just reminded by the research that Raj Chetty and Larry Katz and a group of researchers did out of Harvard that too often times we still have communities that are basically locked in to lower opportunity areas. So for HUD, one of the primary approaches that we take is to utilize housing choice vouchers and to equip families with the information and resources they need to make smart choices about where they ought to seek housing that's near good schools, access to transportation, good jobs and so forth that can create a better life circumstance for them. REHMHelp me to understand exactly how those housing vouchers work. CASTROYeah, so housing choice vouchers are administered by public housing authorities and they're available to folks who meet certain income requirements. REHMAnd what is that income requirement? CASTROWell, it depends on the area median income. So basically, at the end of the day, an individual that has a housing choice voucher will end up spending about 30 percent of his or her income on the rent. And this is a way to insure that, first of all, you're able to make the resource stretch further, but also it's important to note because I think people often have this image of Section 8 voucher holders, that they have no skin in the game. They absolutely do. They do often times work. They're providing for their families and the housing choice voucher is one way to assist them to get good affordable housing, but they're also meeting us halfway. REHMNow, when you look at the nation's poorest communities, how much of a factor does race play? CASTROIt's fair to say that it still plays an intimate role. I think any of us would be kidding ourselves if we said that that wasn't the case. We also have to be reflective about the role that even institutions like the FHA played over time. The FHA is 80 years old and there was a time when it would not insure loans to minorities, especially African-Americans in the United States and it supported practices like red lining and so basically, there was a time when the FHA was part of the problem. Today, it's part of the solution. CASTROAnd I'll give you a precise example of that. Last year, for instance, for a first-time African-American and Hispanic homebuyers, about half of their loans were FHA-insured loans. At the same time, we have moved away, especially over the last 20 years, from the old model of stacking folks in high-rise public housing buildings to using housing choice vouchers more to help spread folks out to areas of higher opportunity. Now, admittedly and this is what the Raj Chetty research found, we still have a long way to go, but we've learned a lot over the last couple of decades about how we can provide folks with a better chance to succeed and moving from aggregating poverty and stacking people in these high rises to a different model was a good part of that. REHMBut how can you spread this around so that a poor black family or a poor white family is not simply put into a poor neighborhood where they're surrounded by people who look exactly like them? CASTROIt is a significant challenge and at HUD, we have an assistant secretary of fair housing with an entire staff whose entire mission is to essentially level the playing field to insure that when somebody goes into the rental market or the home ownership market that they can get a fair shot, no matter the color of their skin. REHMJulio Castro, secretary of HUD, short break. We'll be right back. REHMAnd welcome back. If you've just joined me, the secretary for Housing and Development, Julian Castro, is with me. He'll answer your specific questions. Here is a Tweet, "There's been a lot in the news about St. Louis and Ferguson. What is Secretary Castro doing to reduce the rent loan redlining, effectively segregating regions like St. Louis City and County. CASTROFresh food, that's right, whether you have access to fresh food or it's all going to get fast food through the drive-thru. Access to transportation -- oftentimes we know that there's a legacy of basically environmental racism that has occurred in our country in terms of dumping the things that people wouldn't want in a higher-end or middle-income neighborhood into lower-income communities. REHMSo you've still got redlining going on there? CASTROWell, I have no doubt that some of that still happens. We know that discrimination still happens out there. At HUD, our job is to help find that, to root it out and then to combat it and ensure that there's a level playing field. The fact is that it does happen and so we're working on that in the St. Louis neighborhood, in Baltimore and other communities. It's also -- it's based on race but it's based on things that people at first blush might not first think about. For instance, last year, our Fair Housing Office settled a case with Wells Fargo because they were discriminating against women who were pregnant -- not lending out to women who were pregnant because the loan officer didn't believe that she would actually go back to work. CASTROAnd we got a $5 million settlement and, maybe more importantly, a change in the policy and the approach and the training that goes on. CASTROSo whether it's race or it's something like that or it's disability, I have to tell you that there is a tremendous need for the kind of fair housing work that happens not just at the national level but by many nonprofits out there and local agencies. REHMBut the question becomes how much can HUD actually do? Here's a follow-up email. "Please talk about housing in the neighborhood context: Affordable transportation, access to jobs, access to a healthy environment -- food and exercise." How far can you go? CASTROI believe that we can do some things that are very impactful. I was mayor of San Antonio before I was housing secretary. And I became mayor in '09. And one of the things I noticed early on was that the Obama administration was doing something that was different and quite impactful. It was looking at problems not just as a housing problem or education problem or transportation problem, but saying how can we break through the silos and have all of these federal departments work with local communities on these things holistically. CASTROBut her mother couldn't walk around the neighborhood because there weren't any sidewalks. And there were loose dogs that would create a danger. And that was the first time, as a young policymaker, in my mind, that I thought, "Wow, how connected all of these things are." One of the lasting contributions of the Obama administration, through the approach like a Promise Zone, is that it's broken through those silos and has these departments working together impactfully, more than it ever has before. REHMAnd what about planning for cities to come? Does HUD get into that? CASTROWell, we work with local communities through things like community development block grants and our place-based work. We had something called Strong Cities, Strong Communities that in a number of cities was working very closely to help map out how those cities could address these multi-level issues. I will say though that a lot of the planning decisions and zoning decisions of course are driven by local planning and zoning efforts. They're not something that the federal government, you know, specifically directs or does. REHMNow, you know as well as I do that bureaucracies are hard to navigate. So what are you, as secretary of Housing and Urban Development, what are you doing to make it easier for people to navigate HUD? CASTROThat is a great question. We've improved our website. We've also created a couple of different apps that folks can go and get that relate to HUD's work. One of them is, in fact, a fair-housing app. So if somebody has a complaint. They've -- let's say that they've gone and tried to rent a place or get a loan and they just feel something wasn't right about that transaction, we have an app now that they can go on the Internet and get. And we have improved our outreach through the Web. We're on Twitter. We're on Facebook. Trying to use social media and all the new tools that make it easier for people to digest information, and not just have a one-way conversation, but also be able to interact with them. REHMAnd here's an email from Laura. Actually, it's on the drshow website. She's talking about areas of opportunity, people who decide not to move but instead to remain, improve their homes. As we've seen here in D.C., those distressed neighborhoods are being transformed into gentrified neighborhoods. Would you agree that HUD should promote a balanced approach, making sure resources are provided for both mobility strategies and those who chose to remain and improve long neglected neighborhoods? CASTROI agree with that. And you see that in spades here in Washington, D.C., but also in a number of other communities. So this is one of the fundamental challenges that communities face out there. On the one hand, we want to use our housing choice vouchers to ensure that we don't have a concentration of poverty and the aggregation, especially oftentimes of racial minorities in one part of town, the poor part of town. That's the story of the last couple of decades, trying to disaggregate poverty. At the same time, the question arises then from folks who do live in those older neighborhoods, "Well, hey, what are you going to do? Are you just going to abandon investment in these older neighborhoods?" CASTROOf course, the answer to that is, no, we're not. And we shouldn't. So you have to do both of those things. You have to invest through, for HUD, traditional resources like community development block grants, home funding -- of course, there's other funding at the local, state and federal level. Keep investing in those communities to improve the quality of life for everyone there, but also give families who want the choice to move to areas of higher opportunity, the option of doing that. REHMWhat about the resistance you have from some established neighborhoods to move poor people into those neighborhoods. We've heard a lot about that lately. CASTROOh, there's a ton of it that still happens. I can say, as a former mayor, we would take zoning cases, for instance, twice a month. And you see a lot of nimbyism out there. Now, in a lot of the case, it's legitimate concerns that people have about land use in their neighborhood. I mean, if you own property somewhere or you live somewhere, who wouldn't be concerned about what's going to be right next to you. However, you can clearly see, in a decent number of cases, that there's something else that's animating it. And there's an excellent drama that's on HBO right now called "Show Me a Hero." This is based on a book that was originally written by a former New York Times Reporter, Lisa Belkin, about how this came up in Yonkers. CASTROAnd in 1985, a federal judge ordered Yonkers to build 200 units of affordable housing in what was then a middle-class, mostly white section of the city. Because it had a history of lumping everyone together, mostly African-Americans, in one part of the city. CASTROAnd it took seven years from that order for that to actually happen. And this book and now the HBO drama is about that experience. REHMAnd when it did happen, how did it affect the whole area? CASTROWell, and that's, in fact, Ms. Belkin wrote a little follow up in The New York Times on Saturday -- Friday or Saturday. And one of the points is that, you know, there was no sky-is-falling moment. I mean folks have been generally responsible. Those units are still there. They look about middle-of-the-road in terms of the units around there. But you do get oftentimes these very visceral reactions from people. And you want to say, "Of course, you know, everybody cares about what happens in their neighborhood." CASTROBut if we go back and we look at when affordable housing development has happened in middle-class neighborhoods, in upper-middle-class neighborhoods, and the sky-is-falling fear that often accompanied that versus the reality once it's been done, it is night and day. I mean, I would just encourage folks to take a look at that show or read the book. CASTROAnd those types of situations are still an issue. We had an issue in Westchester County not too long ago, similar resistance. And hopefully that can get resolved in a better way in the future. But it still happens. REHMA couple of personal questions. You and your twin brother, born here in this country, of Mexican-American parents, is that correct? REHMVery close twin brothers. People can barely tell you apart. You both went to Stanford. You both went on to graduate school together. CASTROYeah. We went to law school together, true. CASTROYeah. So for your listeners who are twins, they know what I'm talking about. When -- I used to tell people that when I was in high school, that I would talk to about two or three people the whole day, and one of them was my brother. He and I are very close. We shared bunk beds for most of the time that we were growing up. We went to college and law school together. He says that he couldn't get rid of me. He also -- he's in Congress, in his second term -- he goes around routinely introducing himself by saying that the way to tell us apart is that I'm a minute uglier than he is. CASTROSo that's the kind of relationship that we have, Diane. REHMSo you see him often now? CASTROYou know, I don't -- so my wife and my family and I have been up here a year. I don't see him nearly as much as I thought I would. See, my standing joke is that since he's in Congress, I'm the Castro with the real job in Washington, D.C.
CASTROThey're only in session about 100 days a year. REHMAnd you're listening to "The Diane Rehm Show." If you'll now put on your headphones, we've got lots of callers. So let's go, first, to Jennifer in Amelia, Ohio. Go right ahead, please. JENNIFERHello. Yes. Thank you for taking my call. JENNIFERI just would like to thank Secretary Castro. My family and I just purchased our first home with the help of the FHA program. And we're very excited. And I was thrilled to hear him on the radio this morning and able to personally thank him for the program and its help. CASTROWell glad to hear it. And, Jennifer, I'm glad to hear that you and your family have this great start. And that's what FHA's all about, is giving folks opportunity, to responsible families, by making that access to credit available. REHMAll right. To Pittsburgh, Penn., and to Leslie. Go right ahead, please. LESLIEHi, Diane. Thank you so much for taking my call. LESLIEI listen to you every morning. I'm a big fan. LESLIEMr. Secretary, my comment is for you. I'm 27-year-old new mom. I just got my housing choice voucher last year. I applied in May, when I found out I was pregnant. This July we actually just moved into my new apartment. We were lucky enough to know a landlord with Section 8 properties. The problem is, here in Pittsburgh, a lot of people don't. And most of the properties that are Section 8, I guess, approved or with the landlords that are willing to work with the program, are still in really low-income neighborhoods. And it's really hard to find a neighborhood that's willing to accept people with a voucher. So my family and I are still in a pretty low-income area. The schools here are not that great. We have a one-year-old son. LESLIEI'm just wondering what it is that you think can be done to ensure that greater -- there's greater access to better neighborhoods for housing choice voucher recipients and what can be done about the discrimination that a lot of us face? Because before we found that landlord, we had called so many and they were completely unwilling to accept anyone with a Section 8 voucher. CASTROThank you so much for that. We hear stories like this, unfortunately, too often, of folks -- families who get a Section 8 voucher, but there are very limited options. A couple of things. First, we work constantly with local communities to try and enhance that Section 8 program so that more landlords will, in fact, take those vouchers. Secondly, we try and ensure that the bureaucratic process surrounding the Section 8 program is as tight or as low as it can be, so that more landlords will be willing to take on voucher holders. REHMSo clearly you've still got your work cut out for you. CASTROOh, no doubt. No doubt. We see this all the time. It's a constant challenge. Let me just say, the last thing is that there are some communities, for instance Austin, Texas, that have passed a prohibition of income discrimination ordinance. In other words, saying, you can't discriminate based on whether somebody's holding a voucher or not. REHMAll right. Short break. We'll be right back. REHMAnd if you're just joining us, you can also watch Mr. Julian Castro on our live video stream. Go to drshow.org, and watch it all. Here's a tweet. Your department is supposed to help the poor, who may not have basic Internet access. You can do better. CASTROIt's a great question. You know, fortunately that is something that we've made a priority. It's true that more than half of low-income families out there do not have access to the Internet. As you might imagine, a lot of these families live in public housing. So about a month ago, the president unveiled something called Connect Home. Connect Home is a public-private partnership. We've partnered up with Internet service providers from Google Fiber to Sprint to a number of others in 28 communities around the United States to hook up families who live in public housing to either free Internet or very, very low-cost Internet so that they can be connected and, you know, young people who these days often need the Internet to get homework done. CASTROToday, most Fortune 500 companies prefer that if you're applying for a job, you do so online. Same thing with colleges, when you're applying for college. CASTROSo we're proud of this effort, and this is the start. This is 28 communities. It's a pilot project. But if we can show success, I'm hopeful that in the future there will be more investment in ensuring that low-income communities are connected to the Internet through public housing. REHMHow many employees does HUD have now? REHMSo 1981, President Ronald Reagan. CASTROThat's right, on the day that Reagan stepped into office, we had about 16,500 employees. Today we have about 8,000 employees. REHMNow was there a connection? Did he order the cut? CASTROThat's a good question. Yeah, I've never looked at exactly when each of those happened. I think that it's fair to say that that has happened over time. I don't think that you can peg it necessarily to any one administration. But there has been, in the last few years under President Obama, a strong commitment to ensuring that we make a big push on these issues of affordability, fair housing, sparking more opportunity in people's lives through housing opportunity. REHMAll right, to South Bend, Indiana. Conrad, you're on the air. CONRADYes, thank you for taking my call. CONRADI live in a working-class neighborhood, where houses sell for between $25,000 and $35,000. And the problem is banks will not make loans for houses at that low cost, and so there are predatory lenders who will lend money with balloon payments that people don't understand and have -- they're foreclosing them. We have many working-class families who could afford these houses. They go, because they have cash, to slumlords who then charge very high rents for these houses. CONRADI thought the Community Reinvestment Act might help, but it doesn't seem to help. What can be done to make the banks make loans to people who could afford these houses and fix them up and really make them good? What -- our neighborhood is caught in a vice. CASTROThank you so much for that question. That is something that we hear out there. And the long and short of it is that, in fact, these days, we're trying to do two things, one on the consumer side and one on the lender side. On the lender side, we're trying to work with lenders so that they are more willing to lend to responsible families, families, as he said, who may not, for instance, live in the best neighborhood or have pristine credit but who have shown that they are responsible and have decent credit, get access to a loan so that they can purchase a home. CASTROWe have something called our blueprint for access to credit that we've been working on now for over a year. That entails a series of ways that we're working with lenders to accomplish that. On the consumer side, in January, President Obama announced a reduction in the mortgage insurance premium of the FHA. Remember that I said the FHA is the primary vehicle for insuring loans to families that are first-time homebuyers, families of modest means. CASTROWhat this reduction in the mortgage insurance premium will mean is a savings of about $900 annually to over 2 million families over the next three years. So it's making it more affordable for folks to actually get a loan. Working on the consumer side and the lender side, we think that we'll be able to improve that -- that situation that the caller talked about. REHMConrad, thanks for your call. Here's a question from Barbara. In conjunction with the president's emphasis on fixing the criminal justice system, which we're going to talk about tomorrow, will HUD restrictions against the formerly incarcerated felons be modified? CASTROI do believe that it is time for a conversation about some of the restrictions that have been put onto eligibility for public housing. Just recently, one of the things that we did was partnered with the Department of Justice, for instance, for folks who live in public housing or are the son or daughter of somebody who lives in public housing or used to live in public housing within a certain amount of time to, where it's allowable under state law, help them get expunctions to their record. CASTROSo, you know, this goes to the issue of when somebody's incarcerated, they get a record, and oftentimes that trips them up. They can never get back on their feet because they have to check that box. And state by state, and these states have different laws on this, but they have laws on when you can expunge a record. Well, we're going to be a part of, for public housing residents, ensuring that more of them have an opportunity to do that so that they can get access to employment, access to housing and other opportunities to move forward in life. REHMHere is a caller from San Antonio, Texas. CASTROAll right, my favorite city. REHMJody, you're on the air. JODYHey, thank you for taking my call. JODYAnd it's -- thank for taking -- Secretary Castro, it's really hard not to call you Mayor Castro anymore, but my question is this. You know, we have a movement here in Texas called Battleground Texas, and I know there's been some speculation about whether or not you might be a vice presidential nominee on the Democratic ticket next year, but I was wondering, you know, I really -- I was around when Ann Richards was our governor, and I really feel like, you know, the voters in Texas are more evenly split than the red-state reputation that we have. JODYAnd I was wondering if you would ever consider coming down to -- back to Texas to run for governor. I think that it would really galvanize the Hispanic vote and the Democratic vote, and it's been, like, you know, a pipe dream of mine to see a -- to see a Mexican-American as our first governor (unintelligible) . CASTROI very much, of course, appreciate the question and am flattered by it, but right now I'm focused on doing my work here at HUD. I'm not thinking about running for anything in the near future. I can't say that I never would. You know, I'd be lying to you if I said that. But I do believe that Texas, like a handful of other states, is trending in the direction of the Democratic Party and like we've seen North Carolina, Virginia, Colorado and a number of other states over the last decade. CASTROHowever, Texas is significantly larger in population from those places, and it's going to take, I think, a longer amount of time. But the underlying demographics, as well as the fact that you have a lot of folks moving there from states that are more moderate or even liberal or progressive, into Dallas, Houston, Fort Worth, Austin, San Antonio, and the fact that the Republican Party there has not lost a single statewide race since 1998, it's developed a decent amount of hubris, and it doesn't matter which party you are, that's usually fairly damaging over time. CASTROSo those three factors lead me to think that the time is coming in a few years when you will see a Democratic Texas. REHMBut look at North Carolina. North Carolina has the most Republican state legislature it's ever had, it's got a conservative Republican governor. I mean, how do you see that trending? CASTROWell, it also supported the president I believe in '08 and just, I want to say just missed in 2012. And so it became a lot more competitive. Same thing for Colorado. Twenty years ago, people were talking about Colorado as a Republican state. Today it's I would say a purple state. Virginia, Northern Virginia has just exploded with growth, very diverse, young, has become essentially a state that can go either way and today has a Democratic governor. CASTROSo that -- those kind of underlying dynamics are happening in Texas, but it's a much bigger state, and it's going to take longer to have a full effect. REHMAll right, let's go to Greenville, North Carolina. Hi there, Hugh. HUGHHi, thanks for taking my call. HUGHI'm an attorney and university professor who has worked for most of my career with low-income -- to benefits to low-income housing. So I know firsthand how critically important HUD is and how difficult your job is. My question has to do with the development of low-income housing for the elderly. I've been studying and writing on this, and most of the federal programs that were designed to finance the development of new housing units have been either zero-funded, or their funding's been converted to project assistance contracts for -- to maintain the units we have. HUGHAnd I wonder how we plan to develop sufficient low-income housing for the coming boom of seniors that are going to retire. CASTROThat's right, and so the caller brings up something that is squarely on the radar screen of HUD, of departments like Health and Human Services, because we have to understand that there needs to be more resources dedicated to ensure that there are housing opportunities for the elderly just because you're going to get -- you're getting this wave of growth in that segment of the population. CASTROTraditionally, that was funded with something called Section 202 funds, essentially elderly housing. He's right, Congress has not appropriated resources to keep up with the level of growth. So the president's budgets have requested significantly more funds, generally, than have been allocated from Congress. Our hope is that we can do two things, first of all demonstrate the strong link between providing housing for the elderly with wraparound services, and savings that you achieve in health care costs, especially for Medicare and Medicaid so that over time, we will see smarter policymaking at the federal level in terms of dedicating resources to housing because you save money on the other end. CASTROAnd secondly, we want to do everything that we can to work with local communities to use traditional housing choice vouchers and other resources to assist elderly residents. Elderly and disabled residents head up about 53 percent of HUD-assisted households already, and that's just going to grow in the future. REHMAnd following up on that, here's an email from Thea, who says, I work with mentally ill adults. I have a client, she says, in a HUD project housing unit filled with crime and drugs. I want her out, and she could live independently, but HUD will ban her from HUD assistance for five years if she moves in the first year of the lease. Shouldn't HUD want people to get out of projects, into better housing? CASTROWe absolutely do, and yeah, we'd love to follow up with the person who emailed to look at that. REHMWell, I hope she does. CASTROTo look at that situation and ensure -- you know, what we want is stability and a good, quality place to live for each of the people we serve. REHMNow, how would you like her to follow up? CASTROWell, she can email me at secretary.castro@hud.gov, or we also have a line that she can call, 1-800-955-2232, that's 1-800-955-2232. REHMAnd we'll have both that email and the number on our website. And let's see if we have time for one more question, and that is the lack of affordable rental housing and what you see the administration doing about that. CASTROWe see this rental affordability crunch everywhere. For instance, a couple months ago, the National Low-Income Housing Coalition came out with a truly eye-opening study. It said that for somebody who's earning minimum wage, there wasn't a single city of any size in the United States where if you're a fulltime workers on minimum wage, you could afford a two-bedroom apartment for rent and that only in a very few handful of places could you even afford a one-bedroom apartment. CASTROSo what are we doing about that? Well, I'll give you one example. One of the best vehicles for helping local communities create affordable housing has been something called our Home Initiative. They're known as Home Program funds out there in local communities. The president has requested an increase to just over a billion dollars. At the same time, the Senate has proposed, in its latest committee markup, a 93 percent reduction of Home funds, which would basically mean that most communities won't even have enough to do a couple of units. CASTROThis is the disconnect that often exists right now between the needs that we clearly just, on a bottom-line basis, see that are out there and the funding that is going to these challenges. REHMI hope you're having good conversations with your twin brother about this. Mr. Julian Castro, he is secretary Housing and Urban Development. He was mayor of San Antonio from 2009 to 2014. Thanks for being here. CASTROThanks so much for having me.